The electoral authorities in Ecuador have ordered a partial recount of the votes cast in the presidential election earlier this month. Officials said almost 1.3 million votes would be recounted after allegations of fraud by the losing candidate - former banker Guillermo Lasso. Mr Lasso has refused to accept anything less than a full recount. 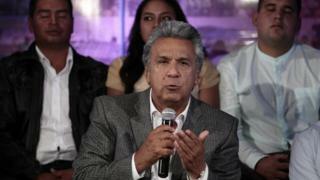 His rival, the Socialist candidate, Lenin Moreno, won the second round with a slim majority of 51.15%. He is set to replace his fellow socialist, President Rafael Correa, at the end of May. The recount of the equivalent of 1.2 million votes, which would account for 12% of the total votes cast, will take place on Tuesday in public in the capital Quito. The council has not disclosed what sort of ballots would be recounted.